Messier 106 is a spiral galaxy in the constellation Canes Venatici. M106 is also classified as a Seyfert Type II galaxy which means that it emits high levels of ionized gas. This is in part due to the super massive black hole at the galaxy core of M106. M106 has a black hole that is about 10 times larger than the black hole in our Milky Way galaxy but what is unusual about this black hole is it is consuming gas at a much higher rate than ours. As the gas spirals in towards the black hole, it is superheated and emits high amounts of radiation. This takes form as microwave radiation and appears to radiate outward in all directions. 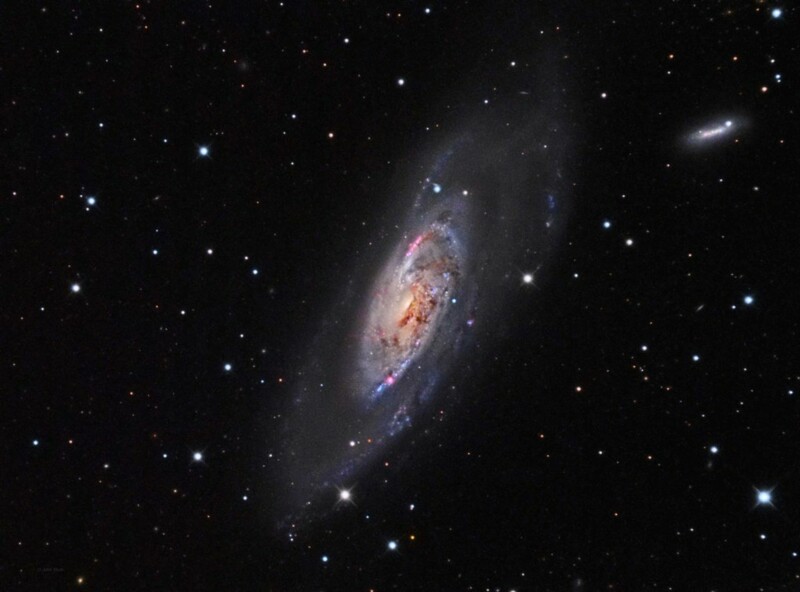 M106 has four spiral arms of which two contain active star formation and two that contain superheated gas only. This is unusual and it is thought the black hole is rapidly attracting gas from the core area and ejecting it outward as a superheated gas. Star formation is thought to be 10 times less that what is occurring in our galaxy. It is thought that during this superheating and ejecting of core gas the black hole is starving the galaxy of its star formation material. It is thought that there is enough gas to last another 300 million years. This image was captured from a site with a limiting magnitude of 6.48 and a magnitude per arc second of 20.86. The sky was clear but there was some humidity after 1am but it dried up by sunrise. This image was captured in one evening.